The African bush is the perfect backdrop for mystical storytelling by the fireplace. 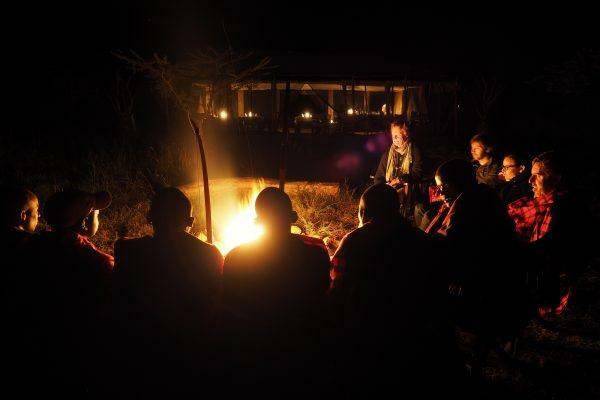 It is after dinner here in the heart of the savannah a time to share stories by the fireplace at Wilderness Camp. We sit around a crackling fire enjoying a drink as we stare up at the clear sky littered with stars and hearing a lion roar in the distance. We are soon joined by an elderly man named Lemeria Sakut many prefer calling him Dorobo. He is one person who you are likely to remember. Dorobo has been part of the Basecamp family practically since the beginning, working as a camp guard. He is a truly gifted storyteller and occasionally happily shares his captivating stories around the fireplace. On this particular night, he wore a red shuka (the classic Maasai robe) wrapped like a Roman toga around him. His sandals were made from old truck tires. He carried with him the air of a man who had seen and done it all and who was certain of his future. He sips his soup which I am told is mixed with roots from local plants. It is part of his everyday diet. He calls it ‘Dawa’ meaning medicine. Adding plant material into the soup is meant to enhance its medicinal value to help cure diseases as well as help in digestion. In his own words Dorobo is “an old man”, but he looks no more than fifty years and is still stronger than most twenty-year-olds. 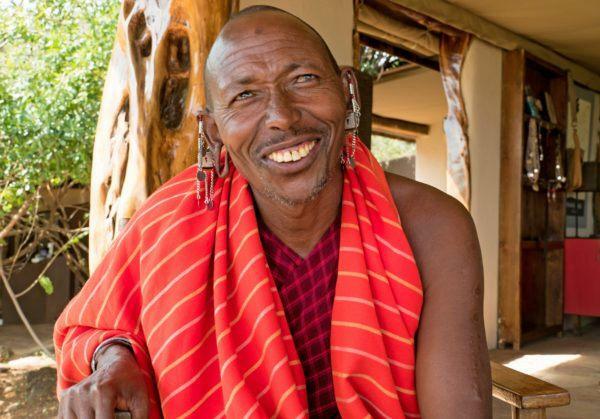 Speaking only in Maa, the language of the Maasai, Dorobo tells a short story about his life encounters which I ask my guide to translate. My guide listens carefully before explaining what Dorobo is saying. he says referring to the Basecamp management who managed to convince him to join them in the ‘modern world’. Dorobo comes from the Dorobo community largely hunter-gatherers, living mostly in the Rift Valley, the highland forests and mountainous areas in Kenya. he is quick to let us know. 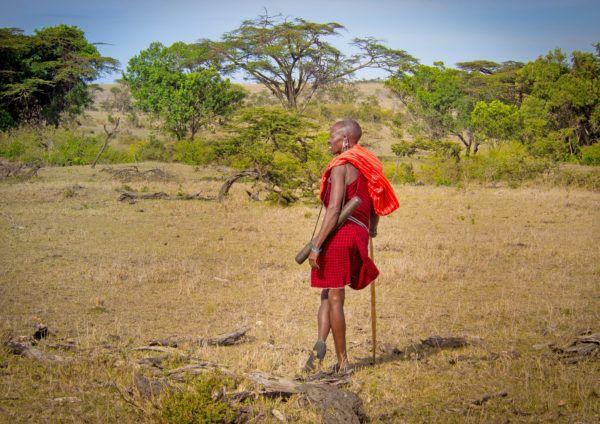 The name ‘Dorobo’ comes from the Maasai word Il-torrobo for ‘the ones without cattle’. The Dorobo are not actually a single people group, but a diverse group of people descended from the ancient San people who originally settled in the Rift Valley around 1000 AD and lived as hunter-gatherers. The tribe is well-known for the profound connection they have with their land, for their intimate knowledge of the natural world, and the delicate balance they have maintained for years with the environment. I loved the conversation, listening to his stories about lion hunts and his encounters with wildlife. Interestingly he explains how they would steal fresh meat from the mouth of hungry lions. I have heard about human hunters but hardly had I heard about human scavengers. Dorobo carefully explains his concern that his tribal practices would become extinct in a few years to come. He points out that today only few Dorobo people still gather food in this remarkable way. Many of them have been assimilated into the cultures of neighboring tribes, such as the Maasai, Samburu, Kipsigis, and Nandi. With advances in the modern world, their hunting and gathering practice is starting to die out. They have to adapt to their new environment, and often make their living through other means, especially since hunting has been banned by the government. I am interested to hear what Dorobo wants for his children in the future. My guide tells me he has more children and grandchildren than he can name. he says. Education, he realizes, is the key to making one’s way in the modern world. Now that he has steady employment Dorobo saves a little money each month for his family. I ask Dorobo how his life has changed since he started working for Basecamp and whether it would be different without Basecamp. Dorobo smiles broadly and chatters away in Maa. Basecamp has changed my life. It is a good thing that Basecamp has operations here in the Mara. People like me can be employed. This is my first time to earn a salary. If I compare my life now to what it was years ago, I’m 100% improved. This is my home, and I am happy that I am able to stay here. Join Dorobo by the fireplace for some story sharing moments.